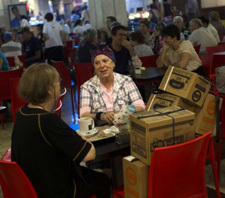 In this Wednesday, Aug. 22, 2012 photo, two Israeli women drink coffee in a shopping mall after collecting their gas mask from a distribution center in Jerusalem. A new U.N. report adds credibility to Israel’s warnings about Tehran’s nuclear ambitions, Israeli officials said Friday, commenting on findings that could provide ammunition to Israeli calls for military action against Iran’s suspect nuclear program. JERUSALEM | Israeli officials said on Friday that a new United Nations report adds credibility to their warnings about Iran, as tensions grow between the Jewish state and its allies over how to tackle Tehran’s suspect nuclear program. The U.N. report also said Iran has effectively shut down inspections of a separate site – the Parchin military complex – suspected of being used for nuclear weapons-related experiments, by shrouding it from spy satellite view with a covering. It drew rapid criticism from Iranian Foreign Minister Ali Akbar Salehi, who said Friday the assertion about Parchin ‘‘does not make any technical sense.’’ Iran denies the West’s claims that it is seeking to develop weapons but its government makes no secret that it sees expansion of its nuclear program [for peaceful purposes to generate power] as a right. An Israeli official said that the U.N report ‘‘confirms what Prime Minister (Benjamin) Netanyahu has been talking about for years now, that the Iranian nuclear program is designed to achieve a nuclear weapon.’’ He spoke on condition of anonymity because he was not authorized to speak to reporters. The United States opposes Israeli strikes. The strain between Washington and its longtime Israeli ally has been on full display this month, with a top U.S. military officer, Gen. Martin Dempsey, twice speaking out against a go-it-alone strike. He was quoted on Thursday as saying he would ‘‘not want to be complicit’’ in such an assault. Enriched uranium is a critical component for both civil nuclear power generation and military nuclear weapons. The United Nations’ International Atomic Energy Agency (IAEA) attempts to monitor and control enriched uranium supplies and processes in its efforts to ensure nuclear power generation safety and curb nuclear weapons proliferation (buildup). But Argentina also taxes accumulated wealth, giving the government license to scrutinize people’s private property to an extent that foreigners are ill-accustomed to. …..
Cardholders will pay the new tax as part of each month’s credit card bills, with the government promising to reimburse the totals each May to taxpayers whose sworn declarations show they paid more than they owed in taxes the previous year. BUENOS AIRES | An influential congressman in Argentine President Cristina Kirchner‘s ruling party has sponsored legislation that would grant suffrage to millions of teenagers ahead of midterm elections next year. Senator Anibal Fernandez – Mrs. Kirchner’s former cabinet chief – has submitted a bill to lower the voting age for citizens and permanent foreign residents to 16 from 18. Mr. Fernandez said that today’s children are more mature than in the past and that there is a trend to recognize adult rights and responsibilities at a younger age. “My father was considered an adult at 22 years old, I at 21 and my son at 18…It’s been proved that kids are maturing,” he said in radio comments Thursday. That could extend the vote to about three million people, swelling voter rosters by more than 10% from the 28.8 million people who cast a ballot in the 2011 presidential election. The bill shouldn’t have any trouble getting passed as Mrs. Kirchner’s Peronist Party faction and its allies have a working majority in both houses of Congress. 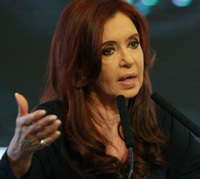 Analysts see the move as an attempt by Mrs. Kirchner to harness her popularity among young people who became teenagers during the impressive economic boom Argentina has enjoyed under her government. In her almost daily public speaking appearances, Mrs. Kirchner frequently calls on young people to be actively involved in politics. The 59-year-old leftist needs a strong showing in next year’s congressional elections if she plans to change the constitution to remove term limits currently blocking her from running again in 2015. Constitutional amendments require a two-third majority in the Senate and Lower House. b) In 2002, 10 years ago, Iran’s secret nuclear program was discovered. Since that time the U.N. has been asking the Iranian government to end their nuclear program, even imposing various sanctions on them. Read the information about Iran’s nuclear program below. The world knows Iran is attempting to build nuclear weapons, and the Iranian government has called on numerous occasions for the destruction of Israel. The Israeli government is considering attacking Iran’s nuclear facilities. Do you think they should? Explain your answer. c) What support do you think the U.S. should give to our long-time ally Israel? Explain your answer. b) Do you think a government should have access to citizens’ credit card records? Explain your answer. Be specific. b) Why will Sen. Fernandez’s bill most likely become a law? c) What is President Kirchner’s motive for getting this bill passed? Be specific. d) What do you think the legal age for voting should be? Explain your answer. The board of the U.N.’s International Atomic Energy Agency censured Iran on Nov. 27, 2009 for its nuclear program, in a motion endorsed by all five permanent members of the United Nations Security Council.